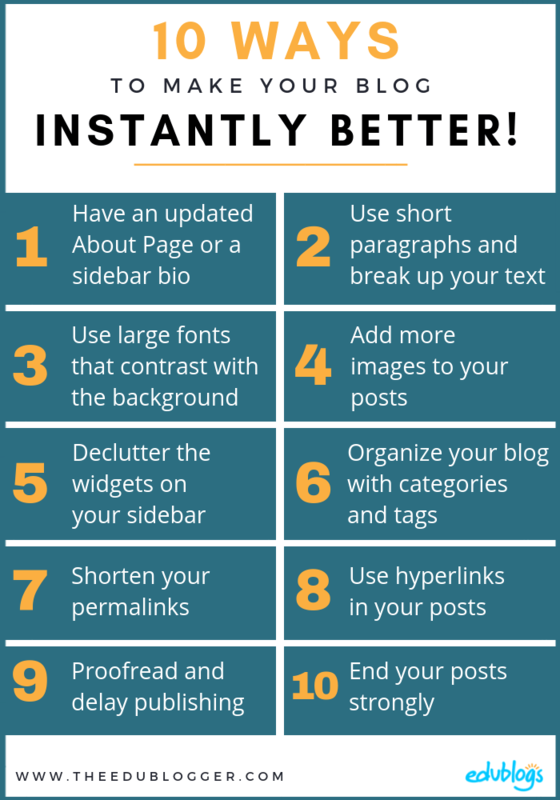 10 Ways To Instantly Make Your Blog Better! Your blog might be full of inspiring ideas but are people reading your posts? Are they sticking around and returning when you publish new content? 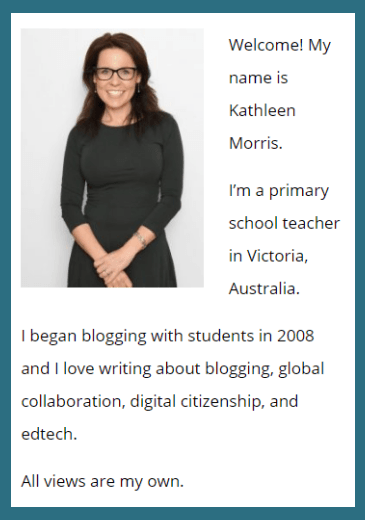 I have the pleasure of reading a lot of blogs as part of my role with Edublogs. I’m going to fill you in on a few easy tweaks that I believe can improve the reader experience and help you build a bigger audience. Regardless of whether you have a professional educator blog, student blog, or class blog, there’s a lot to be gained from building an active and authentic audience. 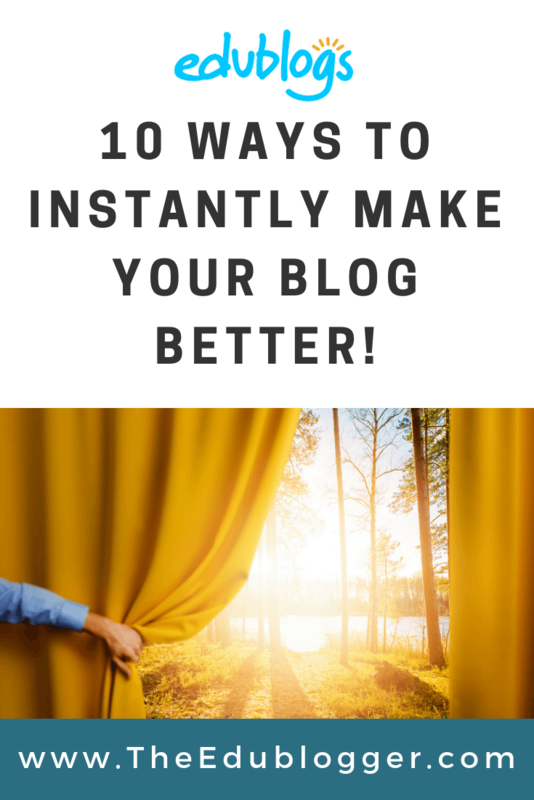 You can start implementing these 10 simple tips today to make your blog instantly better! The very first thing I do when visiting a new blog is look to see who the blogger is. The first port of call is generally an About page. They can be a brief overview of who you are and what your blog is about. They can be a detailed summary of your career or blogging journey. Don’t want to give away too much personal information? That’s fine. Where you live (if you’d rather not be specific, a country is fine). What your role is (e.g. 5th grade teacher, 8th grade student, teacher-librarian, 3rd grade class etc.). Some clues about what the blog is about or who it’s intended for. If you’ve got a lot to share and you’re comfortable sharing it, you could even build a series of pages as Larry Ferlazzo has done here. The more the readers get to know you, the stronger the relationship will be. Don’t want to have an About page? As a bare minimum, I’d recommend at least having some sort of blurb/bio on your sidebar to give readers a quick snapshot of what you’re all about. Here’s my example from my own blog. If it’s been some time since you’ve looked at your About page, maybe it’s due for an update? Personally, if I open a blog post and am presented with a big block of text, no matter how interesting the content, I’m probably going to hit x and leave. There was a popular post on The Slate a few years back called, “You Won’t Finish This Article“. It shares data demonstrating that most people don’t even scroll down after they arrive on your post; they leave your blog almost immediately. The data published in The Slate estimates that most visitors read about 50% of your content. 50% might even be optimistic when looking at similar statistics from other sources. What does this mean? We have to make the text as easy to consume as possible. This means short paragraphs. You want your post broken up into bite-sized chunks. This makes it easy for a reader to scan and take in. Sub-headings are highly recommended as well. We have to write differently. We may have to forget many of the things we learned at school or university. For me, something that’s almost equally as off-putting as a blog post made up of long paragraphs (or *gulp* no paragraphs), is small fonts. Even worse is when those small fonts don’t contrast enough with the background (e.g. light grey… or any light colors). Sometimes you might need to choose a better theme that allows your text to shine through clearly in your blog posts. Or, you can use a plugin like Supreme Google Webfonts. It allows you to change the type and size of the fonts in your post. Look for a font that will be easy to read and stay consistent. Students are often more drawn to using colored fonts than adults. There’s nothing wrong with this but they may need encouragement to choose fonts that will stand out. Yellow or aqua on white backgrounds are really going to make the reader squint! Words are important but don’t forget the power of visuals. Imagery can really add interest to posts and aid comprehension. They also help to break up your text and make it easier to digest. A blog post with a great image is also more likely to be shared on social media, if that’s one of your aims. You can take your own photos, or make your own graphics. Or you can use images from Creative Commons Zero sites like Unsplash, Pixabay, or Pexels. Find a comparison of these sorts of sites here. The important thing to remember here is to avoid using images that are protected by copyright. You generally will want to stay clear of Google Images (check out The Educator’s Guide To Copyright, Fair Use, And Creative Commons). When enhancing your posts with visuals, you aren’t just limited to photos or illustrations. Infographics, diagrams, charts, slideshows, videos, and polls all make excellent visuals to bring your posts to life. Step 8 of our Teacher Challenge offers an overview of some other sorts of tools you could add to your posts other than images. Doing a little decluttering on your blog can make it better instantly! Does your blog have a sidebar? If you haven’t paid much attention to your sidebar in a while, you might find that it has become very busy with widgets that you might not need. If your widgets aren’t adding anything to your readers’ experience, maybe you need to remove some. Search box (usually appears by default with the theme but essential on every website). Email subscription and/or social media information so visitors can follow you. You want your readers to like what they see and want to come back. Author bio (this is often in the About page but can also enhance the user experience). 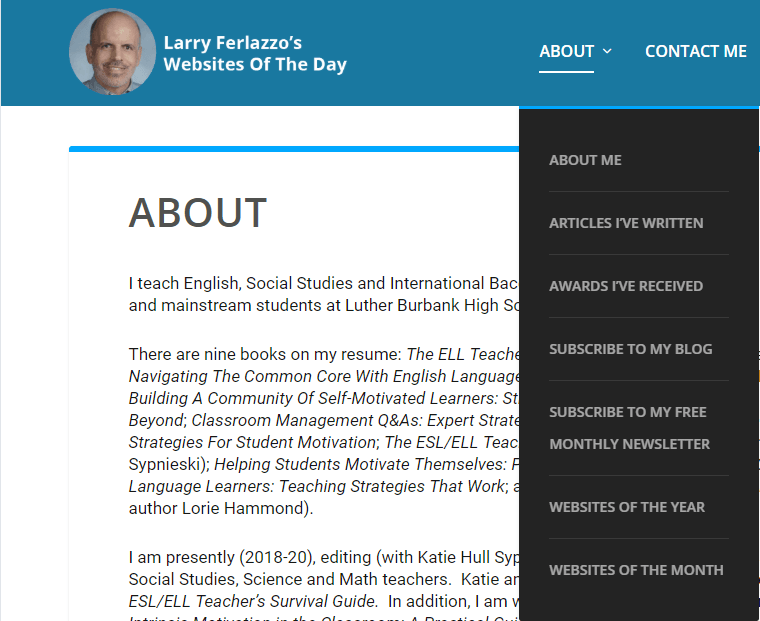 Check out the Edublogs Widget Demo Blog to see what various widgets look like embedded on sidebars. Sue Waters’ popular post 40+ Popular Widgets For Your Blog may also offer some inspiration. If you use a WordPress blogging platform like Edublogs or CampusPress, you’re probably familiar with categories and tags. They’re used to organize your content and help readers find posts that interest them. Maybe you’re not using categories and tags, or maybe you’re overusing them? Fixing this can be a quick way to help readers navigate your blog better. Confused about categories and tags? This diagram might help. If you’re interested in learning more about categories and tags you can read up on some best practices for WordPress. 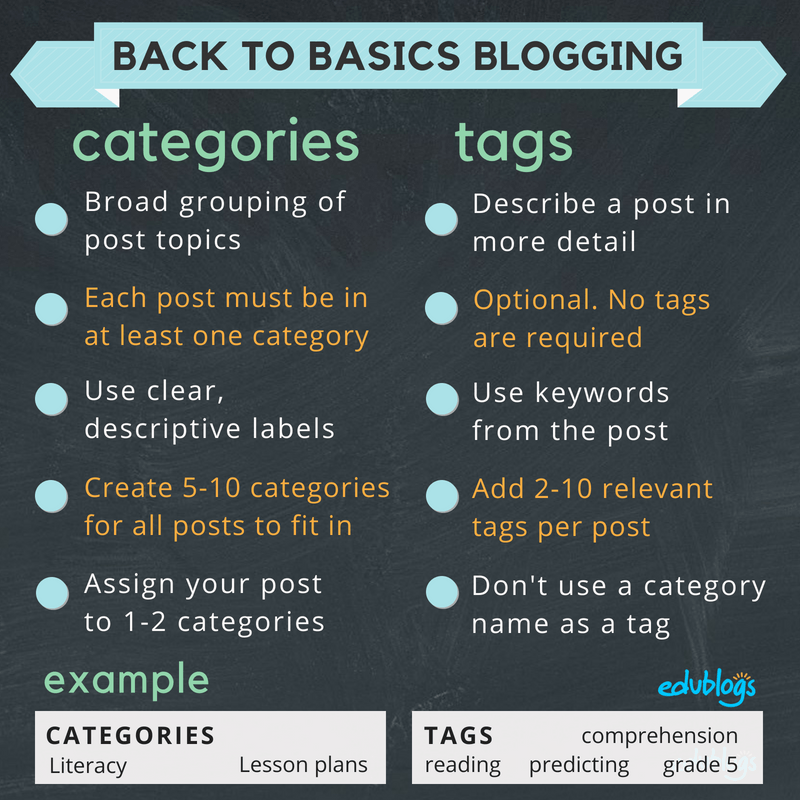 There are also some clear Edublogs help guides about tags and categories. Every time you write a blog post, it will have a unique URL (permalink). Many experienced bloggers like to alter their permalink before they hit publish. It looks tidier for sharing with others. If your blog is indexed by search engines like Google, it can improve your ranking. Apparently, Google doesn’t know what the important words are when there are too many. Google ignores words like at, in, it, of etc. So you may end up getting higher rankings by just including keywords in your permalinks. I could change it to just the keywords “library visit”. Editing your permalink is just a matter of pressing ‘edit’ under your post title. Important: If you do decide to shorten permalinks in future, don’t change the permalink of any old posts or it will break the links to your posts. Do your posts include hyperlinks? Strategically placed links offer a number of benefits. Some bloggers argue that it’s good practice to label your links so it’s clear where the links lead to. You might also want to set your external hyperlinks to open in a new tab. You want people to return to your blog after visiting your links, not get lost down the rabbit hole of link clicking. This GIF demonstrates how to set your links to open in a new tab. Learning how to hyperlink well can improve the overall quality of your posts. It’s an important part of digital writing and is a skill that Silvia Tolisano argues should be taught in the classroom. Learn more about adding links in this help guide. A polished post is definitely going to improve the quality of your blog. It’s so tempting to hit publish once you complete a post, but distancing yourself from your blog before publishing can often enhance the quality of your work. Letting your post “marinate” for a few hours or days after you’ve written it can be a powerful strategy. Looking for typos and other errors with fresh eyes can also be more effective. You might even think of new perspectives or different ways to explain your topic. Preview your post to ensure your formatting is clear and easy to read. Ask a friend or colleague to read your posts (maybe you could set up a reciprocal relationship with another blogger). The Public Post Preview plugin is handy if you want to share your draft with anyone. Read your post out loud. Read your post on a different surface. For example, you might print it off or read it on your phone. Use a free tool like Grammarly. The thing I like most about Grammarly is it catches those small mistakes that your eyes just don’t see — things like double words or missing words. Of course, these automated tools are not foolproof and you need to use your own judgment as to whether to accept their suggestions. You might have a great title, introduction, and body to your post but don’t forget your conclusion. End your post as strong as you started to encourage your readers to take further action and become a returning visitor. Ask some open-ended questions to encourage comments. Link to some other posts you’ve written on a similar topic. Encourage readers to share your post with others if they enjoyed it. Encourage readers to follow you on social media or subscribe to your blog or newsletter. Tell your readers what you’ll be posting about next. Ask your readers to take action after reading about your experiences and tips. 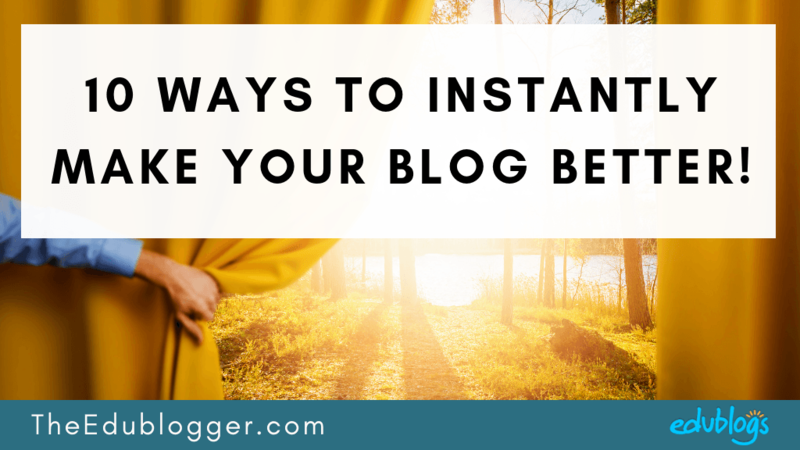 Those are my top tips to make your blog instantly better but I’d love to hear from you. What do you like seeing on blogs? What sorts of things encourage you to read a post? Is there anything that makes you feel like closing a tab instantly? Scroll down to find the comment box. 🙂 A lot of bloggers are known to take their “About” page for granted (Especially those people with personal bloggers). People want to know something about the person behind the blog. Thank you so much! I am just starting out, so this is a big help:). Great advice I will use most of this on my blog to let readers come back for more! Thanks! I’ll try to use these and improve mine. Great Advice! I will definitely use it on my blog! I think this is some good advice! We use the same template for our blogs! Definitely the best one out there!